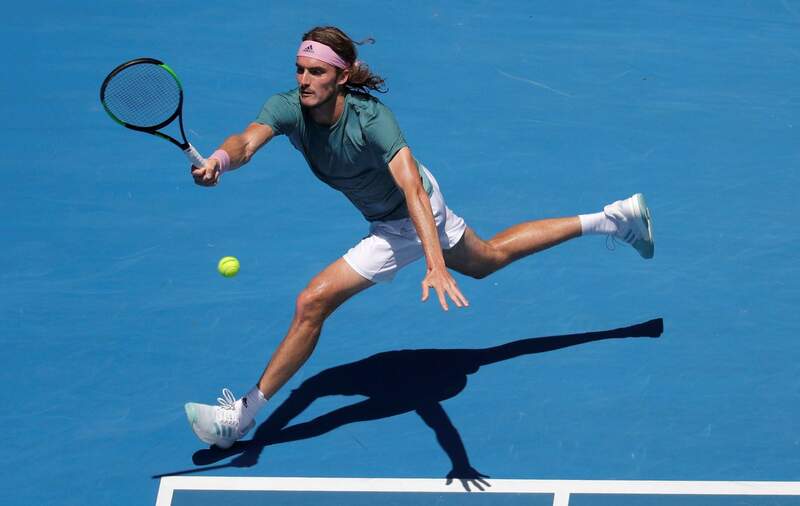 Greece’s Stefanos Tsitsipas makes a forehand return to Spain’s Roberto Bautista Agut during their quarterfinal match Tuesday at the Australian Open tennis championships in Melbourne, Australia. United States’ Danielle Collins makes a forehand return to Russia’s Anastasia Pavlyuchenkova during their quarterfinal match Tuesday at the Australian Open tennis championships in Melbourne, Australia. MELBOURNE, Australia – A post-millennial through and through, Stefanos Tsitsipas sounded as excited about doubling his YouTube channel’s followers to more than 30,000 within a few hours – “Oh, my God. Really? !” – as he was about becoming the youngest Grand Slam semifinalist since 2007. Seated in his courtside guest box were his parents – his father is his coach; his mother was a tennis player in the Soviet Union – and two siblings, along with Patrick Mouratoglou, who coaches Serena Williams and serves as a mentor to Tsitsipas.